Currently, there are no problems with decoration of hamams. 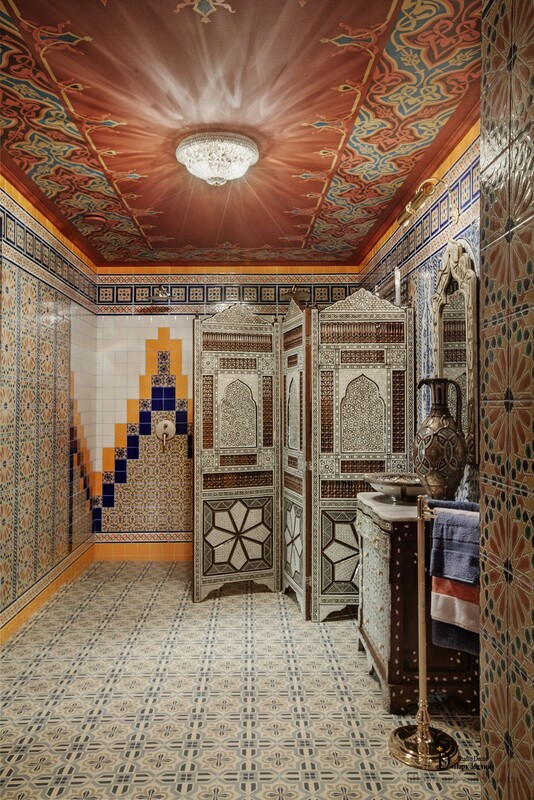 A large number of tile collections with a thematic pattern allows selecting necessary variants for theme and color scheme, and decorating the swimming pool in the Oriental style. 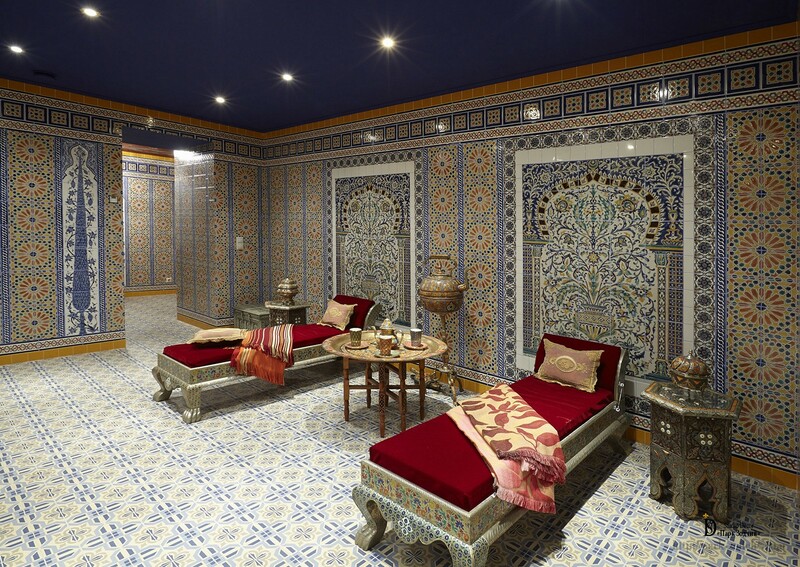 And supposedly, the relaxation area before entry to the Hamam would not attract attention, had it not been for special features of decorating the ceiling. High humidity of the room requires special decorating materials. It is not enough to select a pattern and required color. All details and elements of décor must be tied into a single thread. But this is not enough as well. The size of the room, absence of windows required to be turned into advantage with using decorative and design techniques. Light-colored decoration has been chosen for the small room. Unusual layout of tiles has been used to visually change the parameters. Pattern from the gable wall partially passes to the side walls, thus pulling out the walls. The small textured pattern has been selected as the main pattern. Floors are almost monochrome, and the walls are more vivid. We would like to tell a little more about the décor of the ceiling. Small height required to be visually increased. For this purpose, mural painting has been chosen. And it is not simple, but with an interesting effect. Wide frieze with a floral ornament is complemented by stylistic elements, that create the arch-shaped effect. Chandelier with crystal pendants scatters bright flecks and thus enhances the effect of the dome. But all this would not have been possible without finely selected color and tone of the ceiling. To tell frankly, the artists had not just to experiment, and to do magic with this in the full sense of the word. As a result, the ceiling, despite of the saturated color, is visually dissolving, which is evident even in the photo. The Interior of the swimming pool has been designed basing on play of color contrasts. In the light-colored relaxation area and the main room, the ceilings have been decorated quite differently and it is quite justified. Directly in the Hamam, it was required to create atmosphere of relax, that is facilitated by deep, almost “night” dark blue sky. Spotlights illuminate like small bright stars. They are reflected on the glossy surface of the tiles, thus enhancing the effect of beauty. 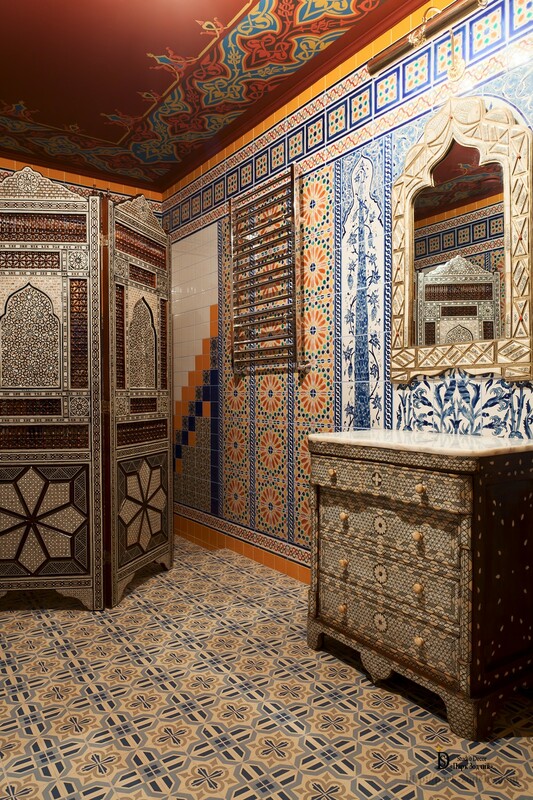 Decorative screen, dresser, mirror not only perform their utilitarian role. They support the Oriental themes and decorate the rest area. At first glance, it might seem that the rooms are completely different in the color design, this effect is given by dark red couches and decoration of the ceiling. However, it should be noted that decorative friezes and color of details of Oriental pattern of tiles are identical to the ceiling mural paintings.